Just once in a while amongst all the fools gold of “free” recovery programs, of which there are quite a number, there is one that stands out like a genuine gold nugget. 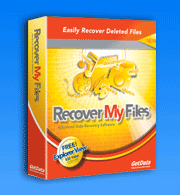 "Recover my files" from www.getdata.com. Installed without issue , registered without issue , then sat silently awaiting its moment. I selected the program to scan for a variety of different file types in a MASSIVE drive on my test PC. WHIZZZZ it was off and running like a trialist for the 100 meters Olympic sprint, simply amazing speed, analyzing and then finding all the lost/deleted files, fragments and bits that had long since”gone off the radar” on my drive platters. It found literally hundreds and hundreds of files and presented them to me for viewing and saving elsewhere. This was exceptional , I have tried literally dozens of recovery programs before , NONE live up to the functionality , speed , file identification and recovery abilities of this software. It runs like greased lightening , it finds everything like a bloodhound on the end of a lead attached to Sherlock Holmes, and collects them all like a giant garbage truck , tipping the data out in beautiful neat rows in shiny plastic bags, labelled and in order on your lawn, awaiting inspection like rows of US Marine recruits ( some you would keep - some don’t make it to the next stage). This program would suit both the novice and the expert technician in adequate measure , and has so many features in its locker that can be tweaked to your hearts content. If you only want to buy one recovery program , THIS IS IT , it will not be beaten by anything else out there so in my opinion don’t even bother looking. One of the best features of this program is its ability to handle a damaged or corrupted drive, and how it handles this is extremely gratifying, to those who thought their data had "gone forever". I am usually less than impressed by most software , a lot of it being all shop window and no backroom staff with their sleeves rolled up, not this time. It deserves all the plaudits for being the top of the pile. There are videos well made by this company expressing the "how-tos" and demonstrating the technical ability of this program, so no "techie - geekasphere" mumbo jumbo from me, just an answer to one question, "Will it recover all the files I thought were dead and gone"
Answer "Yes It will, not only recover the dead, will remove it from its casket, give it CPR and it will be walking about on your drive again like that guy on Dallas when his demise was all a dream! Comment……………………. "Lightening quick recovery software that doesn’t miss a thing, beautifully simple interface with extras for the expert. Finds files of every conceivable type and brings them back to life. Considering data recovery software for home or business ? LOOK NO FURTHER ! This is it."